Watch out! Poison gas coming! quality of life for decades to come. The bus rapid transit system is preparing to purchase some 1300 new buses to replace existing ones, which have outlived their planned life expectancy of 12 years. But, what kind of buses will TM buy? City officials say they plan to purchase mostly Euro 5 buses, which should be less polluting than the current ones. That, however, will depend on how they are maintained. 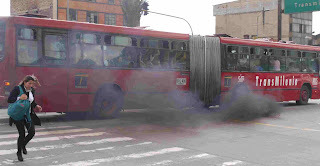 And, judging from the smoke-belching quality of some of the current buses, the maintenance leaves lots to be desired. Clean alternatives include hydrogen, natural gas and electric buses. engines may not have the same accelaration power as diesel, but I’ve seen electric buses charging up steep hills in San Francisco, California. And most of Bogotá is flat. 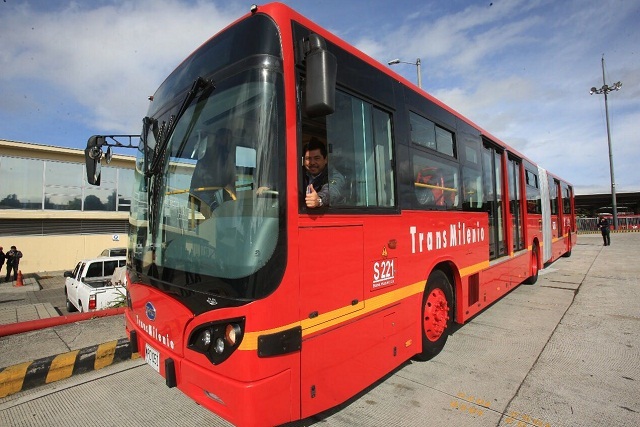 Bogotá HAS considered electric buses, and even has one operating as a test vehicle. From what I’ve read, its disadvantages are mostly cost. Electric vehicles cost more to buy, and the infrastructure for supplying sufficient electricity and charging the buses would be costly. Mayor Peñalosa also says that electric versions of the long, bending buses which Bogotá plans to buy simply do not exist. However, electric vehicles suffer fewer breakdowns and cost less to maintain, so Bogotá could save money in the long run. And then there are all the health costs from pollution, and all the companies which decided not to locate here and tourists who decided not to come here because they didn’t want to breathe smoke. 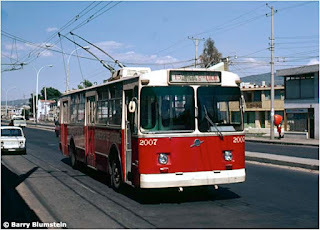 A trollebus in Bogotá. 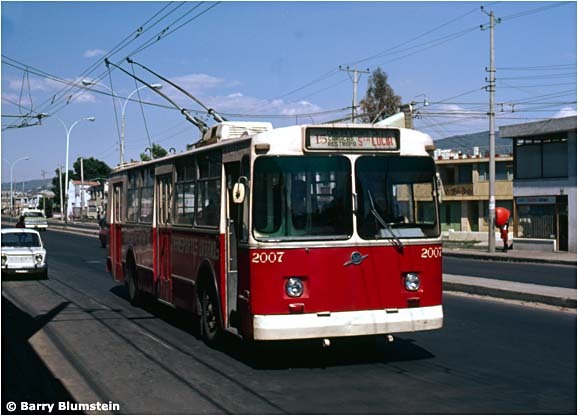 The last clean trollebuses left Bogotá’s streets in 1991, leaving us with belching diesel vehicles. The old is new again: A historic electric bus in San Francisco, California. A modern zero emission electric bus rolls up a hill in San Francisco, California.